Are you looking for a total new parking game challenge? Airport 3D airplane parking is a super cool 3D car parking game look alike, but this time you don’t get behind of the steering wheel of car, truck or other small vehicle. This time you are the pilot of an airplane, and parking an airplane is something totally different then parking a truck, bus or car. After landing your aircraft safely on the ground. Loads of obstacles will be in your way before you get at your destination. Helicopters, planes, safety cars, trucks, towing vehicles or staircase trucks can make a labyrinth that you need to get your airplane through. Cars, trucks, buses those things are all easy to park after you played this super cool airport parking game. Parking an airplane is a real parking challenge even for the most skilled and experienced driver. 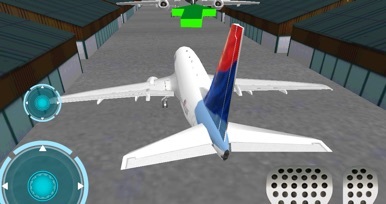 Can you be the pilot that gets the airplane through the airport traffic safely and become the real parking king of this fun and exciting parking game from VascoGames. The different airport levels are set in 3D-style. In each level you’ll get a other challenge. As you drive your way through the airfield levels the game will get progressively more challenging. If you love to drive a car, truck bus or any other vehicles this free 3d game is fun and awesome to play. Aircraft, planes and other objects will stand in your way from conquering this parking mania game!
. Play Airport 3D airplane parking is for free!